Carpeting is pleasant. It will add coziness and color to any room and makes your home feel, well, homey. There really are no bones about it - nothing pulls a room together quite like some fine carpeting. That is exactly why a torn carpet can be so frustrating. Aside from standard wear and tear, carpeting can become damaged if heavy furniture is dragged on it or if your pet uses it to sharpen its teeth or claws. Stained carpeting is troubling as well. There are several great methods for removing carpet stains, however for stains, you can't get out, you may have to completely replace the stained area. Thinking about doing it yourself? You can. Or, you can call Bob A Haines Carpet Repair, and it's not going to cost you an arm and a leg. Repairing a torn carpet on your own may seem complicated, but you can always be sure that we will do a perfect job for you at a perfect price. 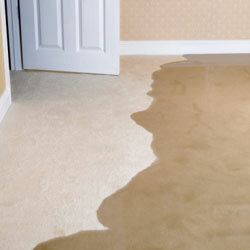 Is your carpet getting older with wear and tear, permanent stains and torn seams? 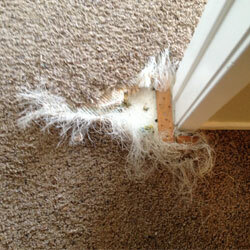 Did your pet gnaw your newly bought carpet causing slashes and scratches that are not pleasing to look at? Stunned by the amount of damage to your home resulting from water damage? 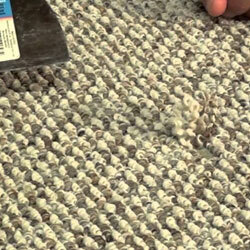 Restoring your carpet from destruction can be overwhelming. Luckily, there’s Bob A. Haines Carpet Repair. Because of the way it’s made, one snag in a Berber carpet can cause it to unravel like a sweater. When this happens to you, Just know we are only one phone call away. You have a choice when you look for a professional to come to your home to repair your carpets. Especially when, if not done correctly, you end up throwing away hundreds of dollars for no reason at all. We're different from others. Here's why it matters to our customers. Our professional team guarantees satisfaction in every quality service we offer. Let us put our experience and expertise to work for you. Bob came and fixed my carpet last Saturday. I had TERRIBLE carpet damage and he came to the rescue! You literally cannot even tell there was ever any damage. He was on time and very professional, and knows what he's doing. I would definitely recommend anyone to Bob if they have carpet damage, especially pet damage. Thank you Bob! Bob was prompt to return our initial call, and quick to come to our home to repair our carpet. We would highly recommend him! Bob is AWESOME. He is friendly, knowledgeable, prompt, does great work and charges a fair price. What more could you ask for?? Would definitely hire Bob again and I am referring him to my parents.